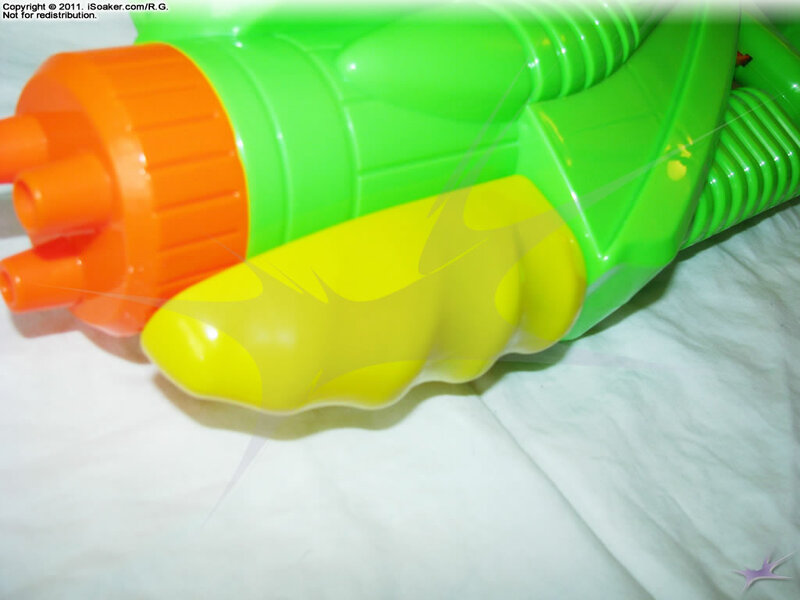 The Water Warriors Sphynx is an air-based water blaster released by Buzz Bee Toys Inc. in 2011; it is a similar size and performance to the Water Warriors Lightning, but does not include an electronic power gauge. For the 2011 version as well, the strap is missing, though the strap mounting points remain. 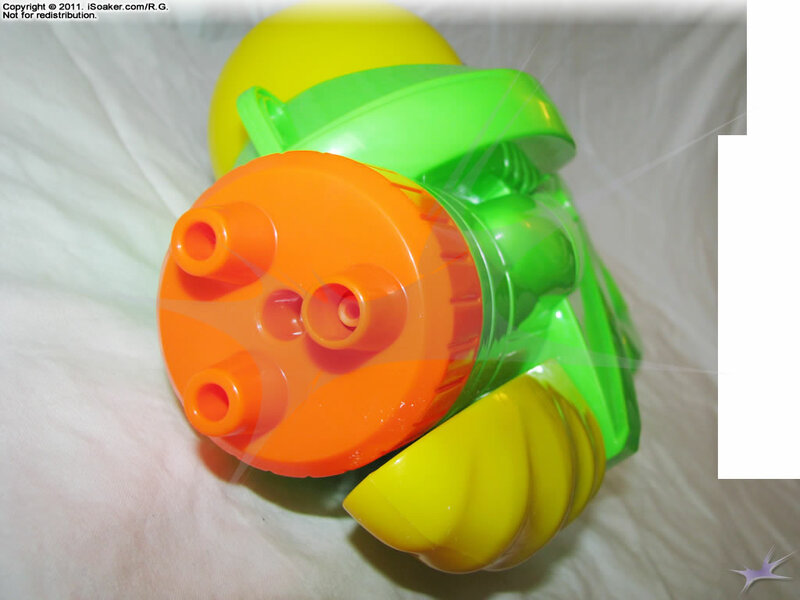 The pressure chamber on the Water Warriors Sphynx was meant to be a Hydro Power chamber (see Water Warriors Sphinx (Hydro Power Version)), but was changed to an air pressure chamber due to the injunction Buzz Bee Toys Inc. agreed to as a result of a lawsuit in 2010 regarding patents held by Hasbro Inc. Despite this change, the pressure chamber still provides good power to the nozzles. The Sphynx features a nozzle selector with 3 nozzle settings. While not quite as powerful as the Water Warriors Sphinx (Hydro Power Version), the Water Warriors Sphynx pushes out a solid, almost CPS-like thick stream on its largest setting while its other two nozzle settings offer decent performance or better water conservation for when one's tank is running low. 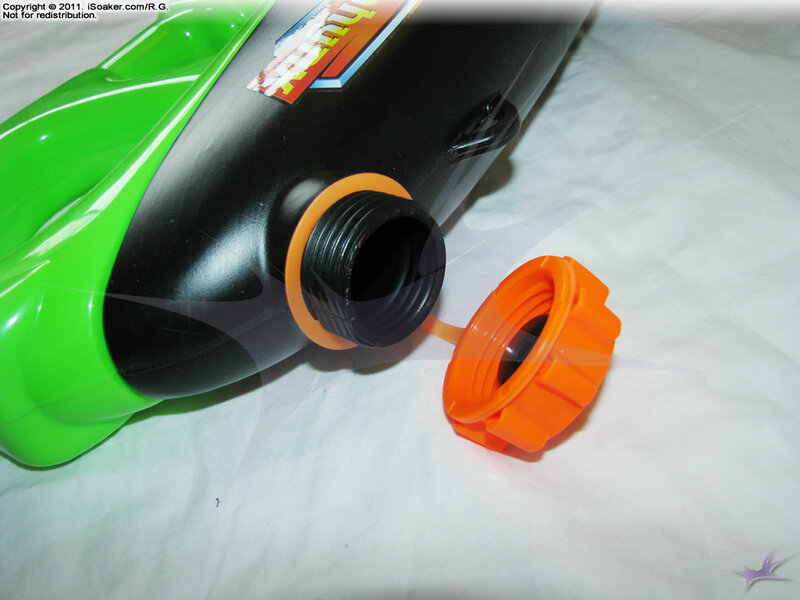 Of course, being air pressure based, to get best stream performance, pre-charging the pressure chamber is recommended to minimize stream drop off as water is expelled. The Water Warriors Sphynx is forward mounted. The grip, itself, has a decent feel and pumping is smooth and typical for a blaster of this size. The pump volume on the Sphynx seems to be slightly less than that of the original Water Warriors Lightning, but more than the Water Warriors Sphinx (Hydro Power Version). While the pressure chamber is roughly the same physical size, the amount of pressurized water available is a little less than the Water Warriors Sphinx (Hydro Power Version) since the remaining volume is needed for the compressed air. As noted above, the Water Warriors Sphynx uses the Water Warrior Lightning's shell, but lacks a functioning electronic pressure gauge. However, unlike the Water Warriors Sphinx (Hydro Power Version), the Sphynx's back side of the grip is smooth, thankfully no longer having a false trigger. The actual nozzle trigger, itself, pulls smoothly and seems rather responsive. The trigger grip area, though, is enclosed making it feel a little tight for those with larger hands. The reservoir on the Sphynx offers at least 4 additional full charges of the firing chamber before emptying. The intake area of the reservoir is near to the rear of the blaster, thus when water level is lower, tilting the blaster slightly upwards allows one to make use of virtually all of the water. While the Sphynx does make use of all it holds, the fact that the reservoir is opaque makes it a little harder to determine how much water is remaining and one must estimate by weight and sound..
All in all , the Water Warriors Sphynx makes a solid addition to anyone's armoury. While not quite as potent as its Hydro Power-based brother, its largest nozzle still packs a solid punch. 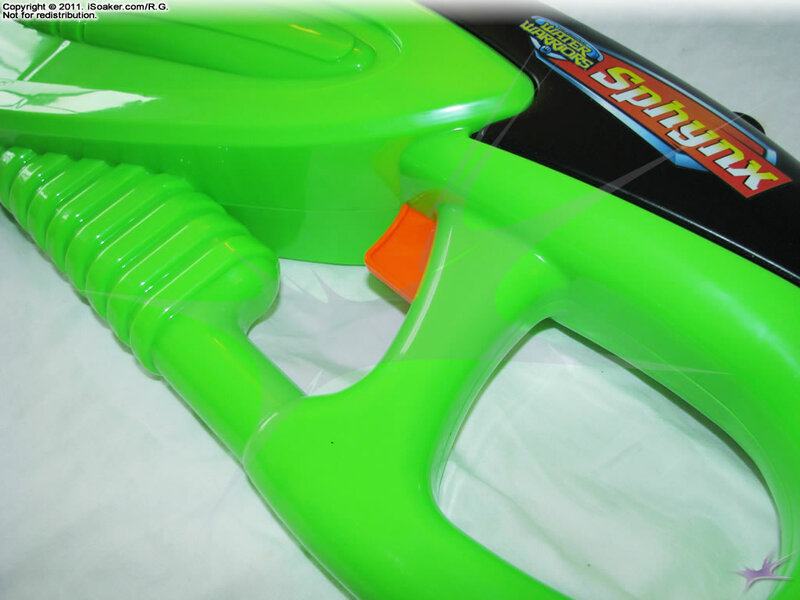 Though one should still be wary of others using larger CPS-based soakers, the Water Warriors Sphynx user can keep pace with anything on the modern water warfare field. Easy to pump, pressurize, and blast away. Air pressure chamber gives good power. Largest nozzle a definite improvement over the original Lightning. Multiple nozzles allow the user to drench more or conserve depending on how much water remains. Reservoir opaque and capacity seems a little low for a blaster of this size. Hand grip area around the trigger small for those with larger hands. Lacks a strap (though loops remain). External reservoir cap tether more prone to damage than an internal anchor type. Forward mounted pump more likely to be damaged if left extended. I recently bought this gun to be overpowered against all the Nerf super soaker. (Where I live its Nerf Super Soaker and nothing else.) The gun is well designed. It has very good balance, even with a full tank. The gun is not so heavy when full tanked. The gun have three nozzle settings. The N5 is a 2X nozzle, and it's good for water conservation. The N7 is like a 3X nozzle and is pretty good. The N9 is the best nozzle settings. It's the most powerful, and it can soak an opponent very fast. The gun hold approximately 1,2L of water and have a 260mL Firing Chamber. Be Careful if you use too much the N9 nozzle, you will use all your water very fast. The Sphynx have a range of 12 meters, it's perfect for a gun of its size. Overall, the Sphynx is a good and powerful gun. The separate firing chamber allow you to pump very fast, and to has longer shots time.